I’ve noticed that a hot shower feels 100x better than normal when I come inside after a cold and sweaty run, a bag of pretzel sticks tastes amazing when I’m ravenously hungry, and my bed is the most comfortable place in the world after a busy day. Actually the last one’s always true… no matter what I did that day. What I am trying to say is, contrast makes everything more awesome. This cake never gets boring because it totally nails the “contrasty” thing. Fresh cranberries are super tart. Oranges are fresh and citrusy. 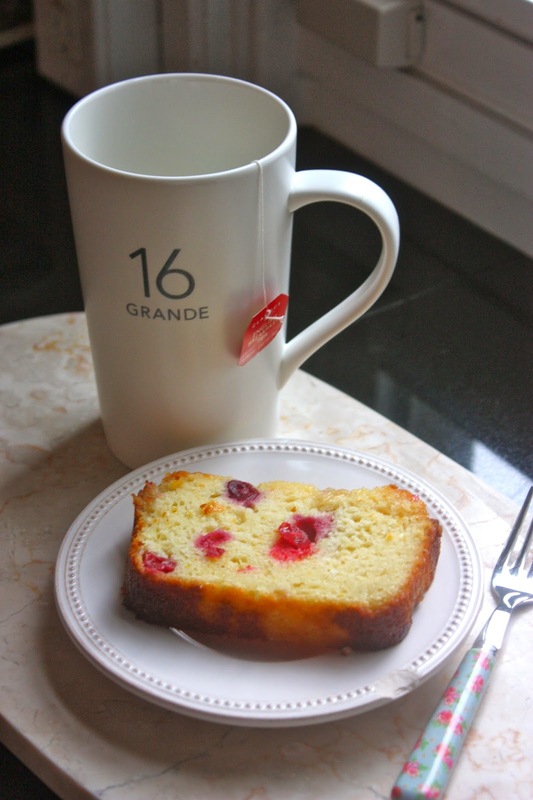 Pound cake is rich and sweet. Mingle all of these friends together and you have the perfect, totally-not-boring, pound cake. Pound cake perfection. This is a great counter-top cake. You know, the kind of cake to just put on the counter top looking all pretty, and as people walk in and out of the house — mom, dad, the dog walker etc., the cake slowly gets nibbled away. And when the glaze hardens and gets all nice and crackly… Ugh. I just wanna pour it on everything. the oven to 350 degrees F. Generously grease a loaf pan. for about 50 minutes, or until a knife comes out clean. the mixture is clear. Set aside. mixture over the cake and allow it to soak in. Cool. Once cool, carefully remove from the pan. For the glaze, combine the confectioners’ sugar and lemon juice and pour over the cake. This simple cake embodies summer — from its energizing citrus-y aroma to its fabulous, vibrant yellow color. Unlike a traditional pound cake, this cake does not have butter — but personally, I like the fruity, exotic notes of olive oil and the tang from Greek yogurt (although this might not be the cake for you pound cake purists!). Just like a wheel of Gouda or a pair of jeans, this cake actually gets better with age. It is delicious straight from the oven, but it is out-of-this-world after sitting on the counter for a few days. Time really lets the succulent lemon syrup sink in, making the loaf super rich and super moist. So, if you can resist, keep this loaf on the counter for a day or two, and then indulge — the wait is worth it! This would be a perfect easy, elegant dessert for a brunch, served with berries and whipped cream — or even better all by itself with a nice cup of tea. This loaf freezes up beautifully, so luscious, velvety lemon-y goodness can always be at your fingertips. Preheat the oven to 350 degrees F. Grease a loaf pan (either regular or mini). Grease and flour the pan.